"I'm a filmmaker, not a scientist." When it comes to science and history, we can't expect the writers to get all the facts right. Maybe we should be able to expect this, but such expectations will lead to disappointment. To be fair, though, good story will always trump good science: real science tends to be gradual, methodical and incomprehensible to anyone without decent knowledge in the specific field. Hollywood Science is common in Science Fiction, but does not generally apply to cases where the writers step outside the bounds of known science by applying generous quantities of phlebotinum to circumvent the normal rules. Often times, there's a Techno Wizard to help explain how it works. If it's an intentional change from real science, it's not Hollywood Science. Thus, for example, the claim that the pyramids are much older than Pharaonic Egypt in Stargate is not Hollywood Science. However, the scene in the movie where they track a probe sent through the Stargate, while it's dematerialized — that's Hollywood Science. It's not necessarily a bad thing. See Artistic License. As Science Marches On, mistakes can result from discoveries made after the show was written. In these cases, we must forgive the writers, since they had no way of knowing. Thus, I Want My Jetpack and The Great Politics Mess-Up are not really Hollywood Science. When footage of the space shuttle in orbit is shown (unless Stock Footage provided by NASA is used), the shuttle is almost always shown orbiting "right side up" with its cargo bay doors closed. In reality, the shuttle always orbits with its underside away from the Earth (because that's the side where the heat shielding is strongest), with its cargo bay doors open (because the radiators are on the inner surface of the doors). Curiously, one of the few shows or movies ever to get this right was The West Wing (where the shuttle was imperiled by an inability to open its cargo doors). Bullets and falling objects frequently disobey the laws of physics. See Blown Across the Room, Variable Terminal Velocity and Bizarre and Improbable Ballistics. Check that - they virtually never follow proper physics. Almost anything where someone or something is in danger of falling into a black hole. A black hole produces the same gravity as a normal object of the same mass and distance. It only can produce higher gravity than a normal object when you get closer to its center of mass than you can for a normal object. (Without going inside the object, where the gravity from parts of it starts to cancel out). You can still fall into a black hole like you can fall into the Sun, but the idea of a black hole as a sort of space vacuum cleaner is right out. Montages used to demonstrate the effect of global events often show it being approximately the same time of day around the world. Armageddon is loaded with Hollywood Science, to the extent that it has become something of a Running Gag on the Bad Astronomy website . Some can live with it, some can't. An incredibly horrible example from Bad Boys II: A truck carrying some cars is traveling at very high speed. One of the cars falls off but is still attached to the truck by a chain. It hits the ground and digs in, thus acting like an anchor. Said truck's rate of acceleration actually seems to increase! A good example of bizarre Hollywood logic can be found in the movie Batman & Robin, where one of the two villains has a diamond-created laser-powered cooling system necessary for his survival. Laser cooling Does Not Work That Way. It is for cooling groups of atoms from "cold" to "damn cold", please pardon the imprecision of that expression. It wouldn't work for anything like the setup in the movie. In Batman Begins, the microwave device intended to vaporize all the water in Gotham City is turned on with people standing right next to it. Keeping in mind that people are 80% water, this is just one of the more obvious reasons why the city-threat plot device is implausible. While we're on the subject of Nolanverse Batman, The Dark Knight "sonar phone" Deus ex Machina has caught much flak for its... let's be nice and just say "implausibility". A Beautiful Mind features a scene in which John Nash explains his "Nash Equilibria" his big discovery that eventually won him the Nobel (Memorial) Prize in Economics. He explains it as "there are 4 guys at a bar, there are a bunch of ok looking brunettes and one hot blond. If everybody hits on the blond she will be turned off by the attention and turn all of them down, but then all the brunettes will be turned off by the fact that the guys are only hitting on them after the blond and thus the guys will all go home alone, but in the movie the "Nash Equilibrium" is to all make an agreement to snub the blond and go for the brunettes and thus for all of the guys to get laid." The problem is that a Nash Equilibrium is when no parties can improve their own situation by acting independently which the solution from the movie does not fulfill as any of the guys who was going to hit on the brunette could at the last moment switch to hitting on the blond. The real Nash Equilibrium is to agree before hand for one of the guys to hit on the blond with all the other guys to agree to hit on brunettes. Many a Disaster Movie. The most ridiculous, though, is definitely The Core. Magnets do not affect energy, regardless of what the movie says. A very tiny portion of the sun's energy hits Earth. Radio signals do not penetrate thick rock. Energy and sound waves diffuse as they travel and become distorted. 1,000 Megatons of force is far too weak to restart the Earth's core. A cave with 5,000 degree heat and 10,000,000 psi of pressure would collapse. Oxygen exposed to high pressure becomes a highly unstable polymer. Many more examples exist, but these are quite egregious. Weirdly, the portrayal of the space shuttle in Earth orbit — "upside down" relative to Earth — is one of the better ones (see the space shuttle point, above). Some people, though, enjoy these sillier aspects of such movies, citing them as part of the fun. Deep Impact, however, was supposed to be serious, which arguably makes its inaccuracies worse. For instance, the four nuclear devices causing a clean cut in the comet (as shown in a graphic in the movie) is impossible on several levels. Skipping blithely over the biology in Evolution, there are two massive chemistry howlers in the the section where Ira Kane (played by David Duchovny) works out how to beat the aliens. Firstly, saying that arsenic is "our" (i.e. carbon-based life forms') poison doesn't really work. Lots of elements are more toxic to humans than arsenic, like, well, selenium, the aliens' poison. And secondly, the idea of a nitrogen-based life form is just whacked anyway, as nitrogen doesn't form into long chains the way carbon does. Nitrogen-based compounds... well, let's just say the shared syllable in Nitrogen, Nitroglycerine, and Trinitrotolulene is not a coincidence. Fantastic Four (2005) has a Star Trek-esque "cloud of cosmic energy" floating by Earth's orbit, and Reed believes this type of cloud may have triggered evolution, and could have untold benefits for humanity and biological science. It looks like the writers were trying to take the hokey "cosmic radiation" origin from the comics and make it more relevant to modern science. But there really is an area of concentrated space radiation right around Earth's orbit, the Van Allen Belt, where the Fantastic Four in the comics encountered high levels of space radiation due to poor shielding. The made up glowing energy blob has less of a basis in reality than the origin from the 60's. Godzilla. Not including the giant rampaging dinosaurs, the film series is just full of 'em. Oxygen Destroyer, anyone? In Highlander, Brenda dates Connor's sword by its absorbency. Yes, the absorbency of a katana. In real life the metallic composition of a sword (which can sometimes give clues as to its date and place of manufacture) can be ascertained by subjecting a small sample of its metal to something called atomic absorption spectroscopy. WE won't go into details (though if you insist ) but the absorption in question is of light. Evidently the writers had vaguely heard of it but misunderstood what it involved, unless the katana really was made by the legendary swordsmith Andrex. The Rocketeer: Zeppelins do not burn like that, dammit! Spider-Man 2 has a depiction of nuclear fusion that is almost, but not entirely, completely unlike real fusion techniques. For instance, the machine creates a miniature sun, but it looks exactly like our sun recolored under x-ray light so that its surface is visible. It even has sunspots, even though a sun that small shouldn't have them. Additionally, nobody is blinded from looking at it. The original Total Recall (1990) has a fairly bizarre example: in the film, Mars' core is supposedly made of ice in defiance of density and temperature issues— never even mind what jettisoning the core of a planet should do when you have a space that will probably be filled by the most expedient mean possible (total collapse). Then again, it's probably All Just a Dream. Twister: The antics of the chasers in the movie would get real chasers killed in the field. Add into this that they get some chaser terminology wrong, some of the science of tornadoes and other severe weather wrong, and that the climax is the heroes riding out a violent tornado just by tying themselves down when they would have been ground into beef by the debris is real life, it is little wonder that this movie is watched by chasers and meteorologists just to mock it mercilessly. Equilibrium has the concept of Gun Kata, a combat martial art whereby it is possible to determine the locations of opponents in a gunfight and their most likely lines of fire, breaking it down into a statistical formula that can be memorized to allow the Grammaton Cleric to evade incoming fire and shoot back at his opponents without looking. Needless to say, this doesn't work in Real Life, as actual gunbattles are based around cover, maneuver, and lines of sight, and can be extremely unpredictable and chaotic. They are virtually impossible to control, let alone analyze for statistical study, and the vast range of variables inherent to a gunfight simply cannot be predicted. All About Steve has a case of this, among other things. What was the deal with that hurricane getting downgraded into a mere tornado? According to the 2006 The Strange Case of Dr. Jekyll and Mr. Hyde movie, nanomachines can completely change the species of whatever gets injected with them. Lampshaded in Iron Man: "Sir, the technology we need doesn't exist". A book from a series trying to capitalize on the popularity of Goosebumps, in which the Mad Scientist 's device uses "infrablue light". Apparently the color green can do some pretty weird things. David Brin repeatedly makes the same mistake as the Doctor Who episode "Blink" in the Uplift Storm trilogy. There is a stasis field where people inside only seem to move when nobody is watching them and an off hand statement that someone shouldn't stare at that quantum life form because it's having trouble and can't do anything while being watched. Despite being technologically savvy (he invented the communications satellite), Arthur C. Clarke gave a ridiculously impossible ending to 3001: The Final Odyssey; he Failed Computer Science Forever, because Emulation Doesn't Work That Way. Lampshaded in Redshirts. Anytime a rather questionable problem needs to be solved, the science team pulls out the box, which ignores any and all laws of physics to find the solution to the problem, oftentimes producing results that cannot be replicated under any other circumstances. Seeing as how they're characters in a television show, this makes sense in context. Also, using black holes to travel back in time/to the real world. Trin: Counter-bacterial? Dont you mean a vaccine? This is an oddly recursive example. Out of universe, a vaccine would be useless and a counter-bacteria (or as it's more commonly known an "antibiotic") is actually what they need. Eureka. Every. Damn. Episode. It's as if the entire series was written by Treknobabble writers. And writers who don't even bother to look terms up when they're trying to be accurate, as when the term "distal phalange" was used to describe a pinky bone. "Distal" is a correct description for a fingertip-bone, but "phalanx" is the proper singular of "phalanges". Somebody put the dictionary away too soon. Granted, non-technical shows like Blue Bloods get that one wrong all the time. Black Hole High seems to want to convince children that science is kind of cool. Unfortunately, "science" is taken to generally mean, "String random scientific terms together and claim this makes sense somehow." For example, the space around a metal ball "loses its gravitational field" therefore, it "makes perfect sense" that it would not only float, but would accelerate every time it collided with something — and this is claimed to be a "textbook" example of Newton's second law of motion. The eponymous black hole itself is ridiculous. There is a minimum size for a black hole to have any stability and self contained mass. By the time they had a black hole massive enough to begin bending the rules of relativistic space, or continuing to exist for that matter, it would have gobbled up more than one hair-brained professor. All of planet Earth would have to take the plunge, at the very least. There's also the inconvenient issue of where they would get all of the super-massive isotopes necessary to even think of constructing a black hole, so I hope they have decent containment equipment, or that school should be glowing in the dark. Also, physics seems generally flexible. This has something to do with the nearby black hole. That a nearby black hole could alter the normal behavior of the laws of physics is entirely reasonable. That it doesn't just destroy the planet isn't. And that it might alter physics in such a way that it can be trumped by one's emotional state or plot-induced personality flaws is... well... Television. "Probability" takes the cake. This week's anomaly inverts the bell curve, inverting "likely" and "unlikely", as a result of Marshall's writing a list of predictions for the future. 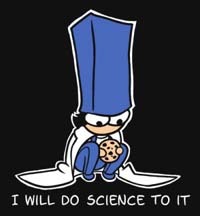 The last of these is that a science club member will die. As the science club members each narrowly survive dangerous accidents, they "realize" that they are now safe, as the laws of probability say that to be so endangered once in a day is at the "far edge of the bell-curve" and therefore it is nigh-impossible for such an accident to happen twice to the same person. This ultimately leaves Marshall in mortal peril as he is the only member of the club not to be "pre-disastered", until he has his own narrow escape. All this adds up to Professor Zachary being patently unqualified to teach probability. If it worked that way, a lot of gamblers would be rich men now: the idea that one unlikely random event happening could make other independent random events less likely is the single biggest fallacy in all of probability — and all of gambling (It's called "The Gambler's Fallacy", in fact). Worse, even if probability worked like that, the whole idea of the episode is that the laws of probability have been inverted, so if the odds really had gotten worse, it should have made their deaths more likely. It's even worse in "Big Brother", where the last numbers of the IP addresses have four digits. Also note that IP v6 would use Base 16, where 1) 255 would appear as FF, 2) numbers are separated by colons, not periods; and 3) the numbers are based on 8-digit binary numbers (known as a byte), so IP numbers would still never rise above 255, which is 11111111 in binary. The writers of the third season of Heroes clearly have no idea how solar eclipses work, giving us a total solar eclipse within a year of the previous one, which is visible all over the world for several hours. Oh, and it has some sort of effect on people's genes. Right. In the Doctor Who serial City of Death, the Mona Lisa plays a significant role as MacGuffin, but the painting shown is much larger than the actual Mona Lisa (most people who have never seen it in person would be surprised by how small it actually is). It's also depicted as being painted on canvas, not wood. Even the My Favorite Martian episode with time-travelling da Vinci got that part right. The Mona Lisa is also too large in Mona Lisa's Revenge, a story of The Sarah Jane Adventures — but they do mention in dialogue that the painting is smaller than most people think. CSI is often accused of Hollywood Science; which arguably applies to the time compression more or less necessary for dramatic purposes. Early on in the show's run, the producers stated that they made the science deliberately bad, to avoid becoming a primer on evading detection for budding criminals. In one episode of How I Met Your Mother, a character waits for a phone call at 11pm at night from Germany. Although there is a six-hour time difference between New York and Germany, Germany is six hours ahead: 11pm in New York is 5am in Germany, not 5pm. The episode "Backscatter" had, in a background shot, the phrase "Email response IP address: 192.3382.1043.010.255". Spoofed in Odyssey 5. At one stage the Odyssey team consult an abrasive sci-fi writer clearly based on Harlan Ellison (who conceived the series). As they can't tell him the truth (that they've travelled back in time five years to avert the destruction of the Earth) the team pretend they're writing a science fiction novel. The sci-fi writer goes into detail on how cliched and scientifically implausible their 'novel' is. Stargate Atlantis featured an episode where one of the heroes had a hard time closing a space station's bulkhead because the air rushing out kept blowing him back. We can assume that he didn't seal himself on the "You die now" side of things, so it seems that air pressure flows from low to high in the world of Stargate. There's a season one episode "The Alternative Factor" where Spock declares the planet they are orbiting has an "oxygen-hydrogen atmosphere". This is extremely unlikely, as oxygen and hydrogen are highly reactive and react rather violently with each other, producing water. Specifically, this is the strongest chemical reaction per weight unit we know about, and we use it in rockets like the Space Shuttle to get satellites and other equipment into space. Very likely Spock wanted to say "oxygen-nitrogen" instead, describing an atmosphere like the one we currently enjoy on earth. Another episode had the cast using what they probably thought was a high number - one to the twenty-fifth power, which is...one. What they probably meant was ten to the twenty-fifth power (1 x 10^25), which is 10 000 000 000 000 000 000 000 000. Team Knight Rider once claimed that "Liquefied nitrogen gas" was a high explosive, even though nitrogen is well-known for being functionally inert in most situations. Presumably they meant "Liquified natural gas". Fringe is probably a deliberate example, violating every physical law and then some, normally as some sort of fringe science doing it. In the 1977 Doctor Who serial The Robots of Death, a character dismisses the Doctor's explanation of what's going on as impossible, and the Doctor retorts that bumblebees fly even though that's also "impossible". This is an urban legend which has been traced back to at least 1934 if not earlier and is based on applying equations to bumblebee flight that were known to be the wrong ones even back then. The Pretender: "Keys": To quote the episode preview: "...Jarod becomes trapped in a hurricane with Miss Parker..." Unfortunately, their method of protecting themselves is simply to board up the windows of the (non-reinforced) building they take shelter in, against purported sustained winds, of an eyewall which likewise purportedly passes directly over them, of 175 mph: some 20 mph above the Category 5 threshold, and some 3 mph above the highest winds ever recorded by ground instrumentation (before it was destroyed) for a landfalling hurricanenote Hurricane Camille, 17 August 1969. Shortly thereafter, they go driving in the storm, which is shown as having roughly the intensity of a mild Midwestern thunderstorm, rather than annihilating everything within at least one mile of the coast. World of Warcraft uses the colour "Infragreen." That's yellow, for those of you playing along at home. Naturally, Gnomes are involved. In Captain SNES: The Game Masta, this is invoked deliberately: Alex points out to his captor that Videoland doesn't have science; rather, it has Science!!. Basically, Videoland science works on what's cool or useful, not by logic or by real-world science. PHD parodies this on two occasions . "Not only do nanorobotics not work that way, genetics don't work that way, and science IN GENERAL doesn't work that way!" Parodied, like nearly everything else, in Italian Spiderman. The classic website And You Call Yourself a Scientist! is devoted to pointing out the numerous examples of bad science in cinema. Likewise, The Nostalgia Chick's video "Playing God" has numerous helpful tips about how to stop science going wrong in movies. Analyst Bronies React: CellSpex compares Sci-Twi opening her device, to "Unleash the magic" so she can study it, to just throwing chemicals in the air and seeing what happens. New meme. I'm a scientist in a movie . In the Justice League episode "The Enemy Below", the villain tried to melt the arctic ice cap to flood the world, even though since arctic ice is floating in water it wouldn't change sea levels much, if at all. However, this may have been a confusion of wording on the part of the writers; while arctic (i.e. north pole) ice floats in water, antarctic ice does sit, in large part, on an actual continent and could indeed cause flooding if it melted quickly enough (Though it still wouldn't be enough to cover the Earth's entire landmass). In fact, an explosion or "impact" destroying the latter is what triggers many of the events in the main plot or characterization in Neon Genesis Evangelion. Futurama's pilot episode, "Space Pilot 3000", had the whole world ring in the new year on New York time. Twice. 1,000 years apart. (Including a couple of shots on other planets.) Although, as the show is a comedy, this may have been intentional. Hollywood Science was also an Open University program run on The BBC, which attempted to assess the scientific validity of several events from movies including Die Hard, Speed and Fight Club, Dan Browning some (but not all) of them in the process.